I have an old SP Max Flow on my Micro Mag. I took it all apart a while ago as I was working on my project. When I put it all back together, the output was lower than I remembered it being and I am wondering what I may have done. I have changed the gauge, but I don't really think that's it. It used to be able to out put 1200, or so. now it will only register 700-750 and it doesn't really R/T like it used to. I took a picture of the internals so maybe it will shed some light on what's going on. The top allen key is pointed at the input, the pencil is pointed at the seat and the lower allen is the output. I was thinking I may be able to bump the output up by lowering the upper spring tension, but wasn't willing to just jump into thrashing on a perfectly good reg just yet. 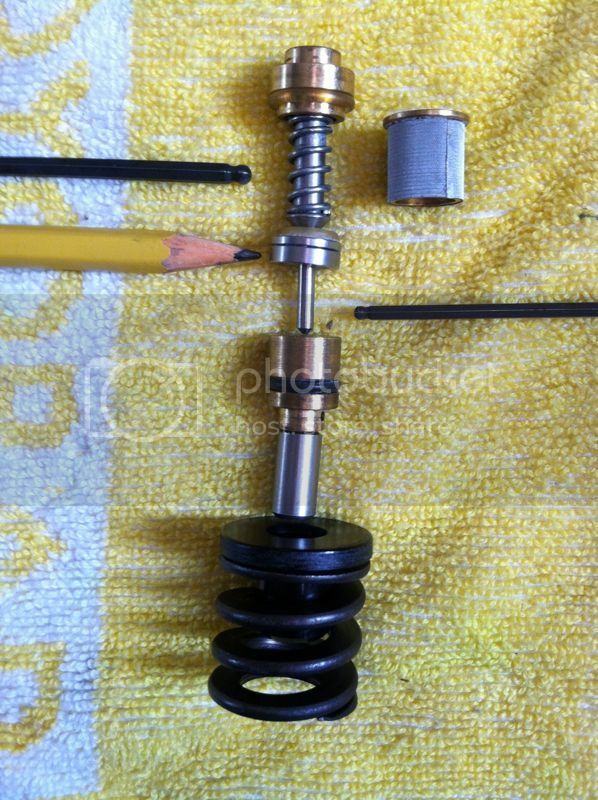 Interesting note, is the reg needle seems to be pressure balanced in that it is drilled through and balances between the brass top cap where it's sealed with an O ring and the out put side, so it just seems to work solely on spring tension. I really hope I just have something out of order here. I'm not familiar enough with the max flow to help you on that front, but I will say many guages vary A LOT especially if you changed brand. Okay - the 'top' spring has nothing to do with the pressure output. The components are balanced in that area and that spring is there mostly to make sure the valve seals. If it is too light the valve may leak. The small pressure that spring can generate has no real affect on the large spring. The piston and large spring are just one operation to open the valve. You seem to have it in order - the small piston is what makes this the HP version. You should just need to turn the big spring up tension up - and it should be going up without a problem. If not look for something that might be hanging the big spring up. Look for binding with the piston and maybe the steel part transferring the spring tension to the piston. If you had problem in the balanced area you would see the pressure changing drastically. And yeah, put on the old gauge if you can. Keep us up on it! Thanks, searching around I found this I'm going to pick up some new O rings and go at again (With my old output gauge). I'll report back. Edit: in the picture the needle seat is inverted. I did not have it in the reg this way, it just ended up like this in the pick. Don't know why I can't edit my first post. Last edited by RatFink; 05-14-2013 at 11:38 PM.